Using SAS Enterprise Miner, you can generate SAS DATA step code that contains scoring functions. The SAS Scoring Accelerator for Greenplum takes the scoring model code, the associated property file that contains model inputs and outputs, and a catalog of user-defined formats, and deploys, or publishes, them to the Greenplum database. Inside the Greenplum database, one or more scoring functions are created and registered for use in SQL queries. Figure 1.1 illustrates this process. 1Install the components that are necessary for in-database processing in the Greenplum database. For more information, see Deployed Components for In-Database Processing. Note: This is a one-time installation process. 2Use SAS Enterprise Miner to create a scoring model, and use the Score Code Export node to export files that are used to create the scoring functions to a score output directory. For more information, see Exporting the Scoring Model Files from SAS Enterprise Miner. 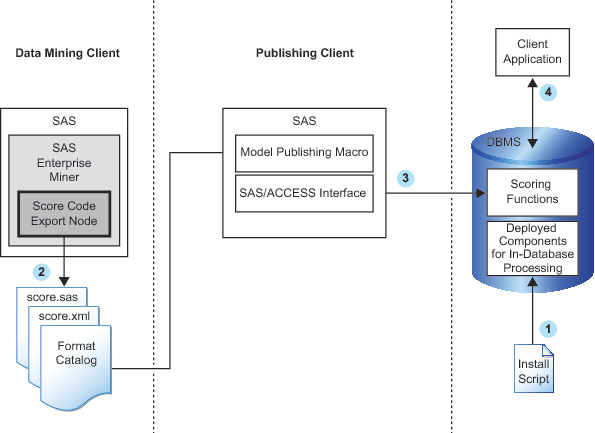 3Start SAS 9.2 and run the SAS publishing macros. For more information, see Publishing the Scoring Model Files. 4After the scoring functions are created, they are available to use in any SQL expression in the same way that Greenplum built-in functions are used. For more information, see Scoring Functions Inside the Greenplum Database.